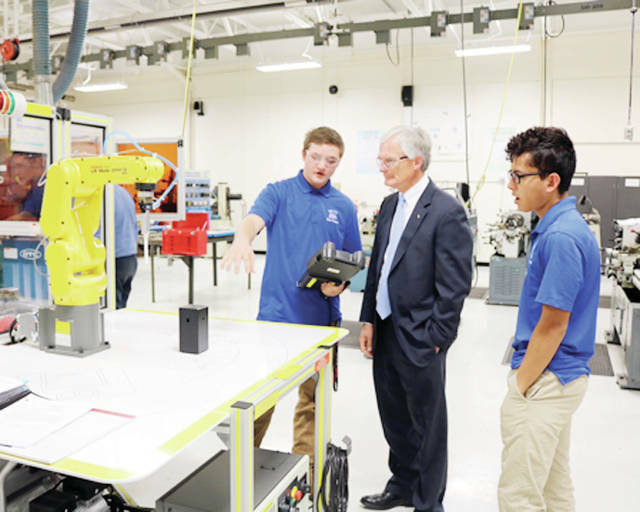 Fifth District Congressman Bob Latta (R-Bowling Green) last Thursday toured Four County Career Center in Archbold , which just celebrated its 50th anniversary. Latta saw the center’s robotics, computer programming, veterinary assistant, computer design, and health sciences programs. ”It makes you feel good to see what these students are doing to prepare themselves for their careers,” he said. https://www.fcnews.org/wp-content/uploads/sites/45/2018/10/web1_latta-at-FCCC.jpgFifth District Congressman Bob Latta (R-Bowling Green) last Thursday toured Four County Career Center in Archbold , which just celebrated its 50th anniversary. Latta saw the center’s robotics, computer programming, veterinary assistant, computer design, and health sciences programs. ”It makes you feel good to see what these students are doing to prepare themselves for their careers,” he said.